Join Calvary’s Employment Task Force and play a critical role in empowering women at Calvary to gain employment. Step Up DC, Calvary’s job placement program, connects eligible candidates in Calvary’s transitional and permanent housing programs to employers in the community. 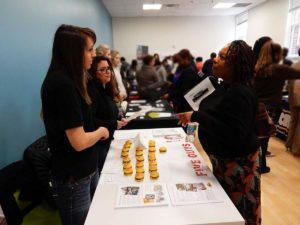 The Employment Task Force is a group of volunteers who look for employment opportunities in the community and reach out to employers to encourage them to hire applicants from Step Up DC. Task Force members should expect to research entry level employment opportunities in the DC area by searching job sites, calling recruiting firms, and paying attention to hiring opportunities in their neighborhoods. Members will also reach out to hiring managers to introduce them to Step Up DC, and connect them to Calvary’s Workforce Development Specialist. Volunteers will regularly check in with one another and with Calvary’s Workforce Development Specialist to maximize their efforts. Step Up DC Employment Task Force members are expected to make an ongoing commitment to volunteer for four hours each week for six months, with the opportunity to continue based on the volunteer’s availability. 4 hours each week, for six months. Mostly done remotely. Ready to find meaningful employment opportunities for women at Calvary?